Is there no limit to the reach of corruption in MorganStanleyGate? And why do Mr. Young's loved ones continue to allow themselves to be duped and manipulated into turning against him and estranging themselves? And with regard to his former fiancee' Leah Krier, why does she lie in such a profuse and profound manner, and then engage in numerous felonies of grand larceny theft? The below complaint was filed today with the self-policing commission for judges in the state of Kansas against a remarkably corrupt judge in a rural county of Kansas. His name is Ron Svaty and his unbelievable transgressions speak for themselves -- in his position, he is a menace to society, and why his removal from the bench and disbarment is being aggressively pursued. As noted below, this judge colluded with local Great Bend, KS attorney Jane Isern in an audacious corruption-laden FRAUD. 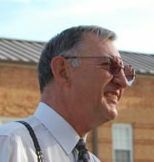 Judge Svaty's misdeeds are grouped into six categories: (1) Jurisdiction Fraud & Denial of Rights; (2) Custody Travesty; (3) Fraudulent Rationale In Draconian Decision; (4) Reckless Derivation of Child Support; (5) Incompetent Determination of Paternity; and (6) Collusion With Petitioner's Attorney & Compromised Ethics Investigation. These are explained below and detailed in the accompanying documents and denoted hyperlinks. As described herein, Judge Ron Svaty has committed transgressions so egregious and reprehensible, his removal from the bench and disbarment are specifically sought. Accordingly this is being separately shared with national news media outlets; the US Justice Dept., the FBI and others, as well as being posted on-line at MorganStanleyGate.com due to its association with the cover-up of this scandal. As further detailed in the attached documents, here's a summary of what Judge Svaty did that was so utterly bombastic, it seems to be taken from an updated episode of The Twilight Zone, for this pertains to a series of macabre unexpected twists that undermine public trust in the U.S. System of Justice. Denial of Due Process -- Despite knowing the Respondent (Spencer C. Young) could not possibly attend a hearing at a venue located more than 1,000 miles away, nor engage representative legal counsel, Judge Svaty held the hearing anyway, and simply ignored his Motions to Dismiss based on the obvious lack of jurisdiction, and other salient evidence that showed the matter to be a canard. Moreover, he went ahead with the hearing despite knowing his his wife of 24 years had just died and her funeral was being held in New York during the week of the hearing!!! He is a monster. Awarded Full Custody to a First-time Mother and High-School Dropout with Well-Known Issues -- Judge Svaty awarded full custody and parental rights to a 37-year-old first time mother (Leah Krier) who continues to suffer from the effects of a nervous breakdown she suffered in Feb. 2010, and who has a history of depression and mental illness, and is required to take high doses of Zoloft daily. She is a high school dropout (who purportedly got her GED after the fact), a repeat felony offender of grand larceny (note: she will be formally charged and arrested in the coming weeks), has a known drinking problem and seemingly possesses no moral values, nor is she capable of rational decision-making since her nervous breakdown. She is a notorious liar (as reflected in the attached Document # 3), and most notably, she represented she was deemed 'sterile' and also took 'the pill' to regulate her menstrual cycle -- notwithstanding his dismay over her announcement she was pregnant, Mr. Young supported her decision to have the baby (a son named Jackson), as they were engaged to be married months before. Took Away All Parental Rights to an Advance-Degreed Ivy-league Educated Father of Three Highly Successful Adult Sons -- Judge Svaty's bizarre custody decision was made to the exclusion of a fit and cheerful 55-year-old father who has already raised three sons, who are now impressive young men. For instance, Michael (24) graduated from Duke in 2008; Kevin (22) is a senior at Duke and twin brother Ryan is a senior at Maryland. 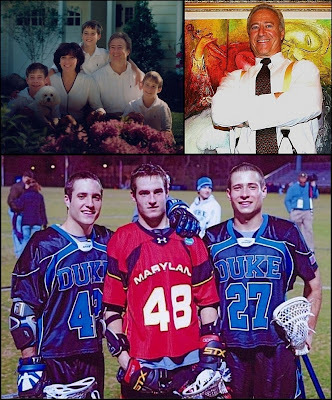 Michael and Kevin are/were honor students and play/ed for the Duke Men's Lacrosse team; and Ryan is an All-American and Captain of the Maryland Men's Lacrosse team. Collectively, they have played on teams that made eight NCAA Final Four Lacrosse Championship appearances, won an NCAA National Championship, and several ACC Championships. And Kevin and Ryan will be playing against each other in the 2011 NCAA Final Four Championships this weekend, which are being televised nationally on ESPN and ESPN2. This is the first time brothers will face each other in the Div. I Men's Lacrosse Final Four, and few fathers have sons who have collectively realized such success. And it is important to note Mr. Young has scars from his days serving as 'goalie' to his sons practicing their lacrosse shots. He hired numerous personal trainers for them as they were growing up, served as Basketball Commissioner for the Manhasset Catholic Youth Organization and Police Athletic League, and coached every one of their baseball, basketball and lacrosse teams in grade school. He even arranged his summer vacations in the midst of a busy investment banking travel schedule to accompany his sons to lacrosse camps and serve as pro bono counselor/coach. Michael now works on Wall St and Kevin will soon follow suit, while Ryan was drafted to play professional lacrosse, which is America's fastest growing sport. For more about Mr. Young please click here, or visit his corporate website. By now you're realizing something's amiss, but an even more dichotomous difference is reflected in the comparison of Jackson's parents, and is presented on pages 3 & 4 of the accompanying Document #1 -- but there's more . . . Rendered a Draconian Decision Based on an Unspecified and Entirely Concocted Rationale -- Although the Paternity Petition filed by Leah Krier sought JOINT custody, Judge Svaty granted FULL custody to her and NO Parental Rights whatsoever to Mr. Young. He also specifically decreed that Mr. Young was to be denied any and all information about Jackson. Judge Svaty based this over-the-top decision (which is typically reserved for felons convicted of child molestation and other violent crimes) based on unspecified and entirely concocted reasons, such as a pedestrian phone call made to his secretary to merely confirm his email address !!! And there is even more . . . Awarded Erroneous Back-Dated Child Support While Ignoring the Fact that it Has Been Prepaid For at Least the Next 7 Years -- Judge Svaty completely disregarded certain facts: (1) Leah Krier has been prepaid $34,000, which equates to the wholesale fair market value of the engagement ring she continues to possess, and owned by Mr. Young, pursuant to both Kansas and North Carolina law; (2) Ms. Krier has not repaid a $20,000 loan from Mr. Young to pay down her high interest credit card debt; and (3) personal belongings she has stolen, including a Mercedes Benz S-320. Judge Svaty accepted a calculation of Child Support based on income he knows Mr. Young does NOT have, but seeking to regain in the resolution of the MorganStanleyGate scandal. And yet there is more, and it pertains to a simple and readily determined fact that could render the subject case entirely moot, and a colossal waste of time . . . 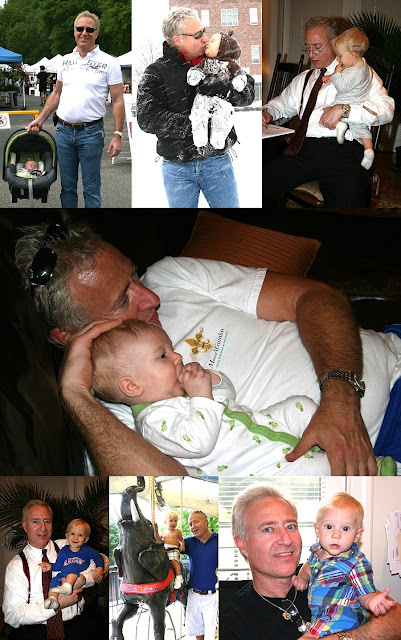 The Identity of the True Father Remains Very Much in Doubt -- Judge Svaty was provided overwhelming evidence calling into question whether Spencer C. Young is in fact the true father of Jackson (click here and refer to pages 9 – 13 of this hyperlinked document), and requested definitive DNA paternity tests be conducted before this matter is considered by ANY jurisdiction. By ignoring this pivotal and readily discerned fact, Judge Svaty demonstrated profound incompetence or an unsavory underlying agenda that warrants a thorough investigation. And finally, we have a most disturbing manifestation . . . Collusion -- The facts overwhelmingly suggest Judge Svaty colluded with attorney, Jane Isern of Brown, Carpenter & Isern in the sequence of events described herein, and thus make an absolute mockery of the US System of Justice. Supplement to Prefacing Ethics Complaint -- An ethics complaint was earlier filed against Ms. Isern with the State of Kansas Office of the Disciplinary Administrator ("SKODA") for yet another blatant and prefacing fraud in this case, on which she was caught red-handed. Accordingly, this submission also supplements that complaint against Jane Isern -- and this is why SKODA is copied on this transmittal. Compromised Investigation -- It has also been observed that the integrity of the investigation into Ms. Isern's misdeeds has been substantially compromised, and will no doubt implicate others in this growing mess, including the District Court Administrator for the 20th Judicial District in Kansas, John Isern, to whom Jane Isern is related. Unbelievable Hypocrisy -- What is especially noteworthy, and an astonishing instance of hypocrisy, is this: SKODA exchanged numerous emails with Spencer Young saying that they refused to communicate by email, and therefore the results of their findings would only be sent by regular mail. And they did so after Mr. Young painstakingly explained he does not have an address, and lives a nomadic existence due to his victimization in what may be the worst bank foreclosure fraud and eviction in US history, as it as on a mortgage that was: (1) NEVER late; (2) had NOT matured; (3) was NOT in violation of ANY loan provisions; and in the case of his residence (4) PAID-IN-FULL !!!!! In addition to the judicial investigation called for here, a criminal investigation into Judge Svaty's behavior in this matter will likely implicate other parties and reveal additional culpability of a corrupt and unlawful nature, which will ultimately trace back to the ongoing cover-up efforts in the now massive MorganStanleyGate scandal.